A father son duo like no other. I recently had the pleasure of an invite on a trip to the Bahamas at a place called Tiger Beach. When most people think of a beach, they are thinking white sand, girls in bikinis and guys checking them out, perhaps a man with a tray walking around selling drinks out of coconuts with umbrella’s, not here. You really have to look for the beach, it’s 30 feet underwater with no sight of land around, no umbrella drinks however. Sad, I know. But it does have something most other beaches do not, and abundance of tiger sharks and lemon sharks. The trip was organized by a father and son team by the name of Leander. Now I consider myself close to my father, we work on motorcycles together, he’ll be rebuilding carburetors on his while I’m trying to put mine together next to him all the while making small talk but mostly just asking each other if we have any idea what piece fit’s what and “did you steal my wrench?” But these two that I met on the trip to Tiger Beach have a different kind of bonding experience. 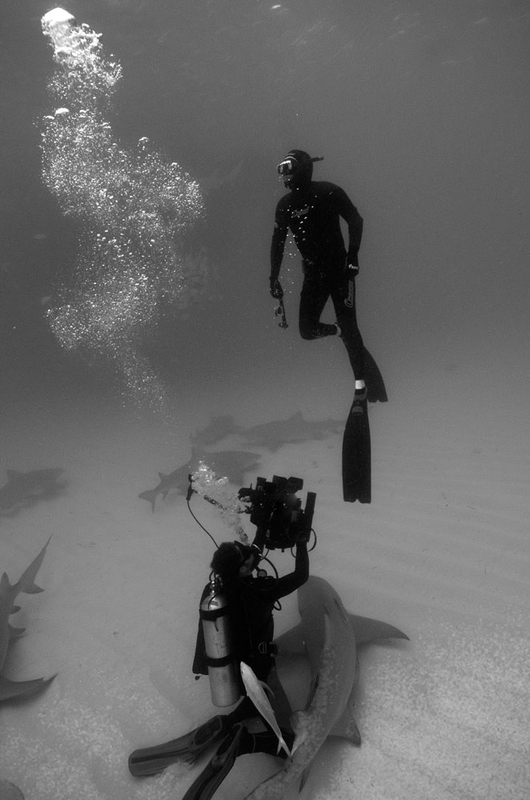 They free dive with Tiger sharks, and Lemons, and Reefs, and whatever shark they can get into the water with. It’s truly one of the best uses of father son bonding time I have ever had the pleasure of witnessing. Wolfgang lives in Bolivia, a retired banker who spends as much time as possible living what he loves most and free diving with sharks. It is one of the most beautiful activities, graceful and silent. You can really see the connection that he has built and the pure understanding he has developed over the years for these gorgeous animals. Felix who resides in Miami with his wife and new born son seems to be born right into it, with a natural ability to be relaxed and comfortable right in the mix of a school of 50 sharks in close quarters. Most people aren’t comfortable in this mix but these two truly understand the animal that they love so much and it really shows when they are in the water with them. When most people have exited the water, dried off, downloaded the photo’s they just took and are sipping on a nice hot chocolate, Wolf and Felix and still out there until the sun is touching the horizon getting every last moment available in with the sharks. It was truly an honor to meet them and spend time with them, there is always something to be learned from people like these. 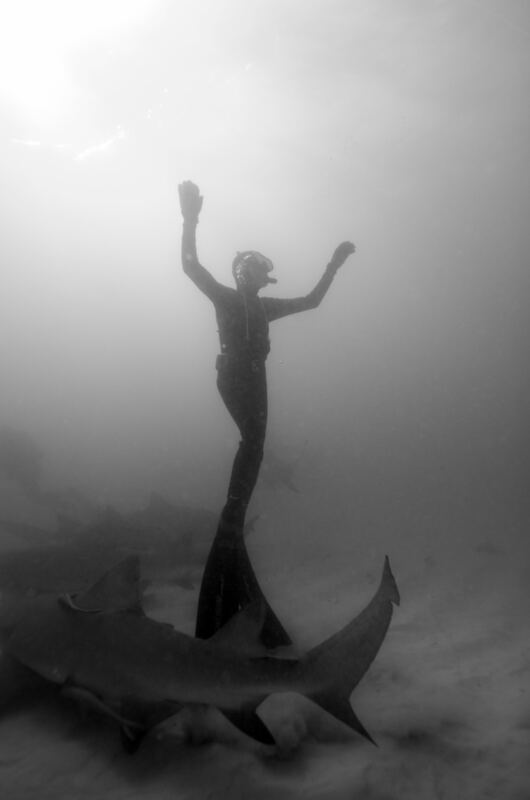 This entry was posted in Uncategorized and tagged Bahamas, Dolphin Dream, Felix Leander, Lemon Sharks, TIger Sharks, Wolfgang Leander. Bookmark the permalink. 4 Responses to A father son duo like no other. thank you for sharing !!! i fully agree give any human being a chance and you will learn ….. once again our planet is perfect….it is NOT to late to be concious and caring !!!! So good to see your article. It was a great trip and I look forward to seeing all of you again! Great post WIll! You can see why i love them. I hope this becomes an annual pilgrimage for you! Hi Will, you said it my friend. Those two, single or together, are among the best. They are wonderful to watch and just as nice to talk to.